The first and only complete guide to tarot interpretation written specifically for teens. • Provides comprehensive interpretations of each card plus instructions on how to use the cards, care for a tarot deck, and read the oracle for oneself and others. • Contains spreads, exercises, and at-a-glance card summaries. • Includes language and life examples geared specifically to the needs and concerns of teens. • Written by the coauthor of Love Planets (50,000 copies sold) and the author of The Everything Tarot Book and Teen Astrology (10,000 copies sold). The ancient art of reading tarot cards is a universally popular method of interpreting what's happening in one's life and finding answers to critical personal issues. Tarot for Teens uses examples common to the teen experience to teach how to interpret the cards and apply the oracle to life's timeless themes and challenges: the quest for love, issues of work and career, and the search for spiritual insight and personal growth. The author offers comprehensive explanations of each card that can be applied to any tarot deck and provides a wide range of sample spreads and exercises. She also explores the tremendous variety of tarot decks available today. Tarot for Teens is filled with possibilities and connections--astrological correspondences, numerological references, mythological explanations, interpretations for cards in both "upright" and "reversed" positions, and practical advice for doing readings--to maximize the fun, potency, and teachings of the tarot. The Tarot is great for getting focused. I've noticed that quite a few young people aren't quite sure what course to follow. They can't make a decision about a career path, or they feel overwhelmed by the diversity our culture offers. While there are always people who take a long time to find their right path, decisions made while young will affect decisions still available in adulthood. So choose carefully--and let the Tarot help you to envision what really sparks your enthusiasm and interest. Use it to turn your imagination toward your own future life, to examine a wide range of life's possibilities, to widen your horizons. As you continue to work with the cards, be sure to use them for dream work. Choose a card and put it under your pillow at night. Get yourself acquainted with your dreams for the future so that you can readily imagine yourself exploring many opportunities. Get moving in the direction of your dreams now. Start investigating the pathways that lead to your desired future. When cards that show problems turn up, pay attention--these are important messages from you to yourself. Take a good look at the negative or problematic issues so that you can get a handle on them, make improvements, and take control of your destiny. When The Fool appears, you may be feeling "out of sync" with your life. Underneath you already know something needs to change--but what? You are being asked to take a risk, to do something on faith in yourself. Past experience may have made you wary of taking chances, but now's the time to put yourself to the test. You're still in a state of innocence. You may be a virgin. You could have just encountered your first love and be feeling unsure whether to take that leap. A new opportunity of some kind is indicated, if you are willing to take a chance. You seek adventure. You may fear making a fool of yourself, or be embarrassed about something you've done or not done. Fear of making a wrong choice is an issue. Lack of opportunity for change. Risky business. Taking unnecessary chances for the sake of the thrill. Something holding you back from going where you want to go. A new romance gone sour. Struggling against circumstances. An inexperienced person taking senseless risks. Possibility of being duped. You took a chance and it backfired. Review circumstances before acting. It's time to take charge of your destiny. Learn to use the tools already at your disposal to better your life. New resources are available now. You want to be in control of things. You are studying hard to achieve. If romance is in the air, you are attracted to the right person. You are developing creative abilities, stretching yourself to the limit. You want to shape your own reality your way. Seek out opportunities by contacting the right people. Finding your true destiny. Being on a spiritual path. Someone who is learning new and interesting things. Becoming an adept. Don't do anything rash. It's time to wait and see. Lack of self-confidence. A need to discover inner powers and resources independently. A question of identity. Indecision about educational choices. Need for self-searching to determine right goals. Develop a positive outlook on problems. Unrealistic romantic expectations. A rival for some desired outcome. You are not in a strong position now. Misuse of magical energy. You are achieving a higher degree of self-awareness. Hidden inner things are becoming clear now. Your intuition is good. Wisdom is developing. You want to penetrate to the heart of the matter. Keeping one's own counsel. Having secrets, or someone else keeping a secret from you. A romantic situation requires more understanding. There are puzzles. Factors of which you are unaware. Something is going to be revealed. You need insights into others' motivations. A spiritual connection. A neophyte who is just learning the universal "secrets." Disappointment in love or unrealistic ideas about romance. Dreaminess and spaciness. Wanting to be alone. Questioning relations and other people's motives. Need to avoid people without spiritual ideals. Don't ask for more information than you can handle about the situation. You are not in harmony with your inner Self. Partial knowledge is all that is available at this time. Do a reality check on your relationships. M. J. Abadie (1933-2006) was a professional astrologer and psychotherapist with a specialty in dream interpretation. She did archetypal research with mythologist Joseph Campbell for over 20 years and wrote numerous books on astrology, psychology, and spirituality. She authored the bestselling Love Planets and Teen Astrology, and her Everything Tarot Book was placed on a Popular Paperbacks for Young Adults list by the Young Adult Library Services Association. 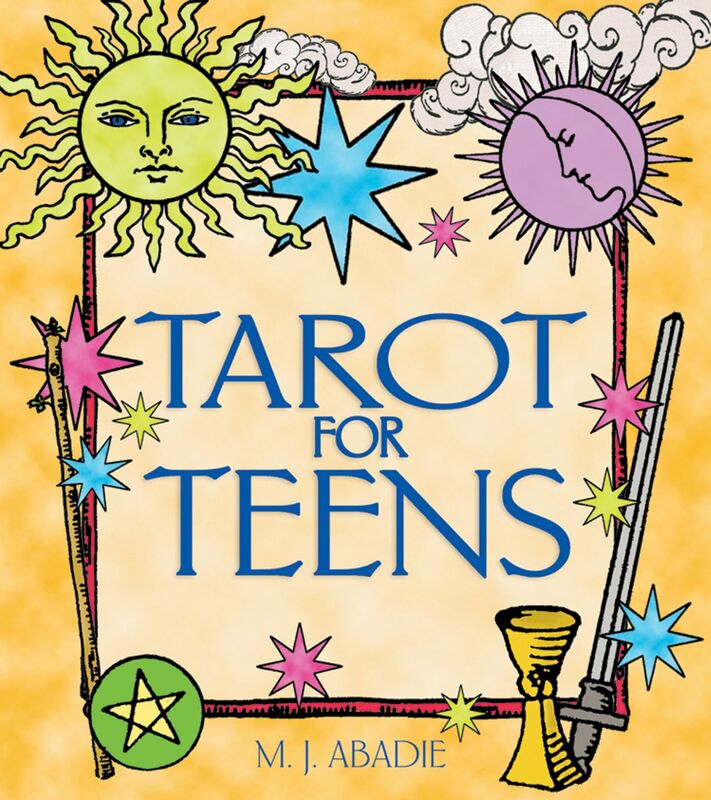 "I highly recommend Tarot for Teens. . . . It would be a great addition to a young person's path of self-discovery." "I feel strongly that this book will enhance the learning experience and become a life-long companion for any finding the tarot a satisfactory part of their spiritual lives."